The easiest way to water your hanging baskets and patio containers. Many pots can be watered at once. 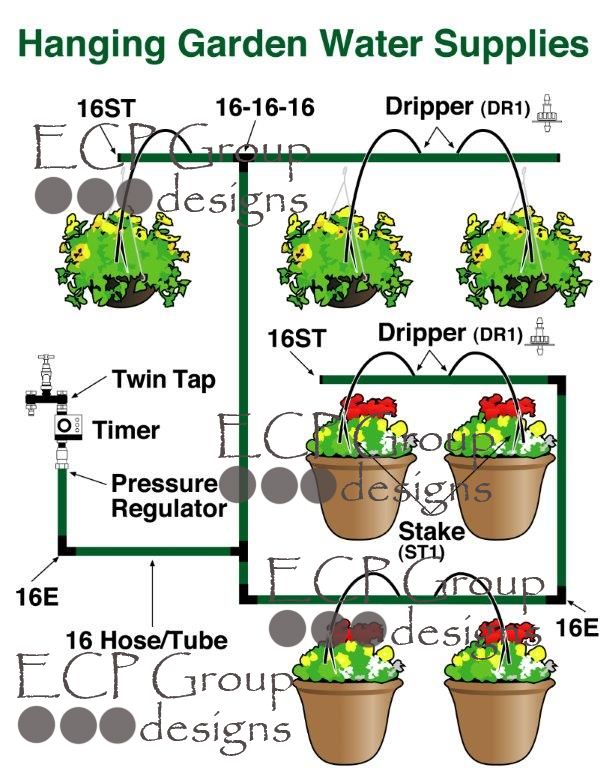 Only one dripper will water up to a 30cm (12 inch) diameter hanging basket. 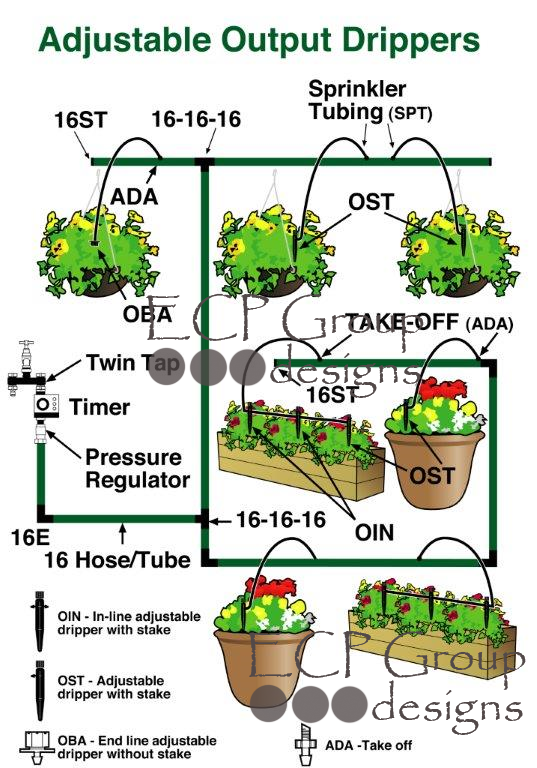 For larger baskets install two drippers. If after settings up the system you find that a pot is not getting sufficient water, it is easy to insert an extra dripper. Ideal for locations that require a discreet watering system. Utilises the latest in Micro Drip technology. Micro tube is placed in an unobtrusive place and is taken to baskets and pots with a tee piece. A Micro dripper is placed at the end and secured with a stake. Maximum 30 drippers per system. Our kits contain all you will need. Suitable for when you have a variety of pots and containers of different volumes. 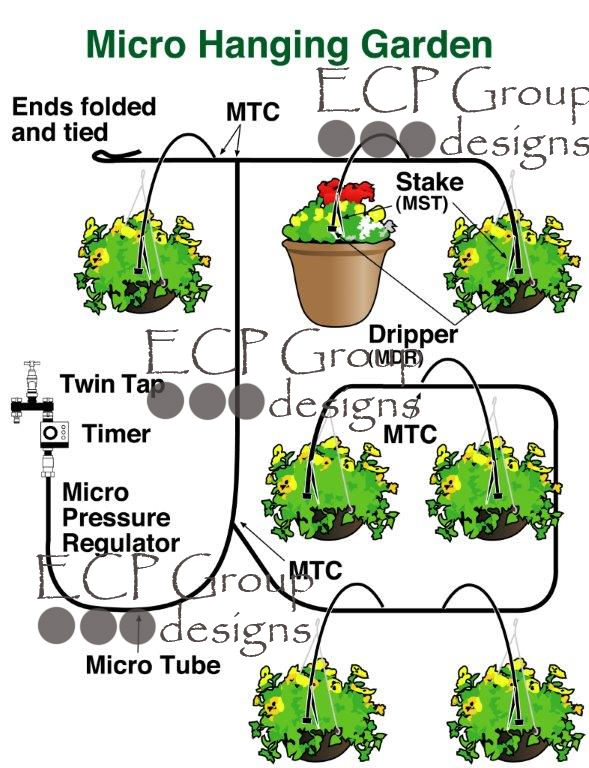 The drip rate can be adjusted to suit your pot size. Drippers adjustable from 0 to 20 litres/hr. When the pot is very large the drippers will gently squirt water giving a less concentrated watering spot. Use with 16mm tube or hose as the supply pipe and 16 fittings. 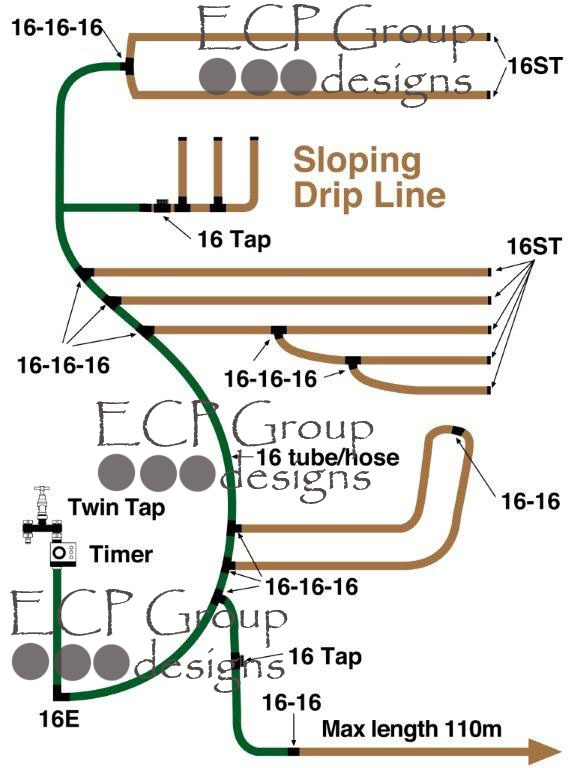 Up to 3 drippers can be run from one take off (ADA) with the tee piece (STT). Good for increasing humidity and can be placed in the crowns of ferns. 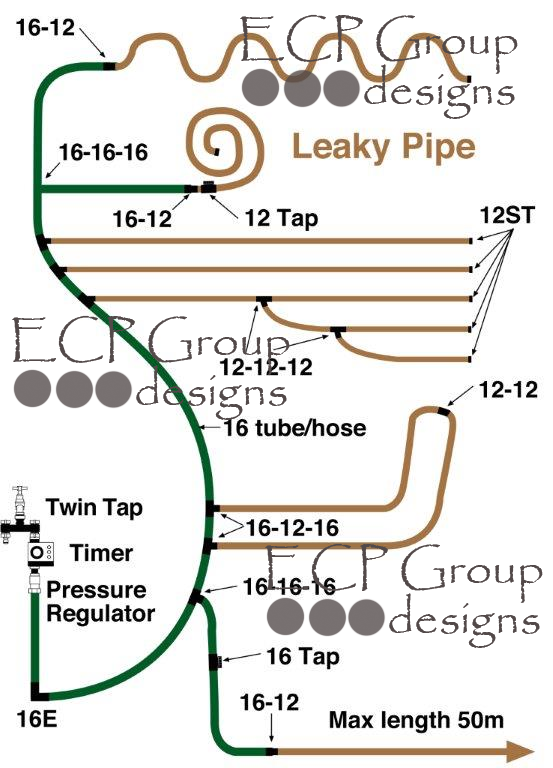 Leaky Pipe is robust, long lasting and has an even output. Totally porous hose with no concrentration water spots. No drippers or emitters inserted, the water oozes out evenly through the wall of the of the hose so that roots and soil cannot block the pores. Not suitable for surface use must be buried or have a covering of soil or mulch. Uses 12 fittings, is smaller than standard hose and not to be confused with other amateur porous hose. Available in a varity of conveniently sized kits. A black pipe with internal drippers spaced every 30cm. This advanced drip pipe is pressure compensated. The internal flow path is designed to resist clogging and at the start of each cycle self flushes / cleans the drippers. Fits all size 16 fittings. Good for use from less than clean water sources e.g. rain water, streams.